Over the past few years we have been working to breakup our monolithic application into microservices. This has given teams flexibility to grow and scale independently as well as enable different technologies. It has been amazing to watch unfold. All of the technical benefits of microservices aside, we started to see some impacts to our engineering culture. Teams can run and operate independently, which is great, but also has resulted in slightly less collaboration and sharing than we previously had. The fact is, we have some really exciting things happening and we needed a forum for people to come together to talk tech and share. Many ideas were up for discussion and consideration. Things like guest speakers, mini conferences, this site, and more. As a first step to get the ball rolling we kicked off an event called “Beers with Engineers.” The name actually came from a local Meetup group. We just liked the concept of having a beer with a fellow engineer to talk tech. We wanted to take this concept inside and provide a forum for our technical teams to gather and discuss the cool things they are working on, what problems they are facing, and what innovations they are coming up with. This was the first of many events we hope to have and while the format will vary between sessions, the motivation will remain consistent: strengthen our engineering community and create a forum to share across our tech teams. 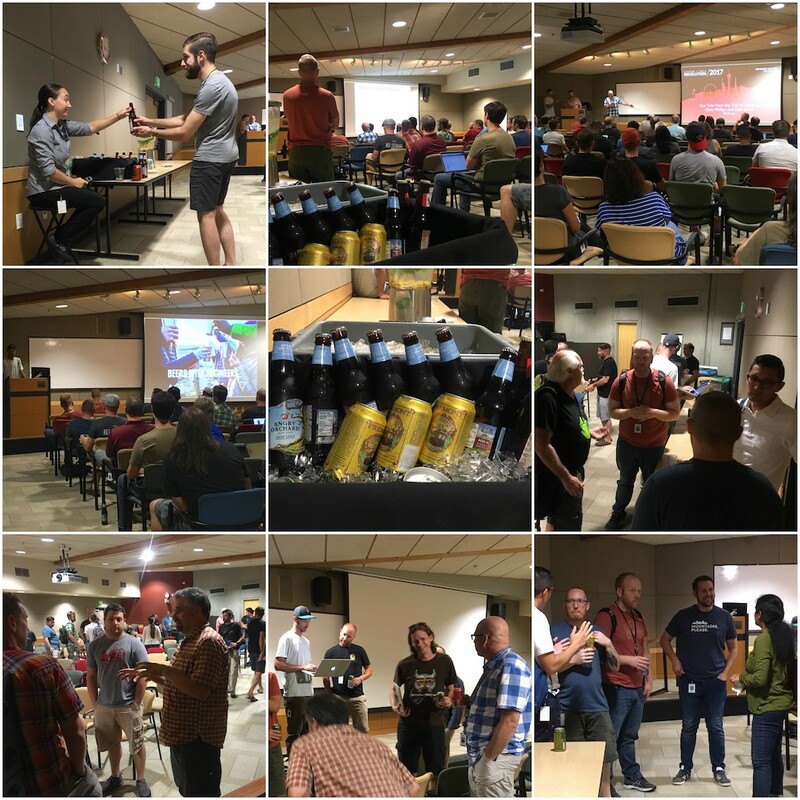 Our first “Beers with Engineers” session was formatted as eight 10-minute talks given by our peers with time at the end to socialize and seek out additional information. Topics included AWS, design systems, infrastructure monitoring, how we were able to swap out our search engine on the fly with no impact, and more. It seemed like a big hit and a lot of people were thrilled about the concept. Of course, it might have helped that we served beer. That was just one of many comments we received. People were animated and anxious to discuss the topics as well as other ideas for bringing our technical community together. It was exciting to hear and see our engineering community rally, collaborate with new people, and cross-pollinate ideas that were sparked by the presentations. The format left a fair amount of room to improve. Even though the talks were only 10 minutes, having 8 in a row was a bit much. The audience had more questions than anticipated for each speaker and this ended up cutting in to the social time. Toward the end people were starting to feel overwhelmed with information and the time we set aside for socializing and questions ended up being fairly short. Next time we may have fewer talks with some time in between so people can discuss and get up to walk about more. We may also consider ways to make it more interactive. Here are a few pictures taken through the eyes of a smart phone during the event.